Sir Ian McKellan has disappointed X-Men fans by insisting he won't appear in a spin-off sequel based on his character Magneto. The veteran actor starred in three X-Men films as the magnetic villain and movie bosses are said to be planning a new movie to reveal the character's beginnings. The project will follow in the footsteps of X-Men Origins: Wolverine which featured Hugh Jackman's X-Men alter-ego. But McKellan, 70, is adamant a spin-off featuring Magneto will not involve him - he's too old to play such a demanding part. He tells EmpireOnline, "There's meant to be a Magneto script floating around, but I've not read it, so I suspect it wouldn't involve me. 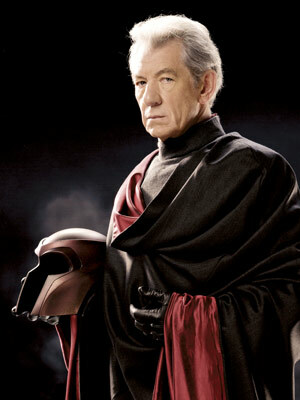 I think it would be about the younger Magneto, and the most I could hope for would be to top and tail that. They can't have someone whose face is as lined as mine any longer!" Why can't they just use that thing they did in last stand? Just find a young actor for the first part and let him do the rest. i agree.. we NEED HIM to take maybe a lil part of the movie..
hwoarang1986 wrote: i agree.. we NEED HIM to take maybe a lil part of the movie..
Or give me another role...The father perhaps?! i really don't like the concept of the x-men that some of them has to be that old and very young. I mean, come on! Prof X and Magneto doesn't look that old in comics. RLAAMJR. wrote: i really don't like the concept of the x-men that some of them has to be that old and very young. I mean, come on! Prof X and Magneto doesn't look that old in comics. But the BIG difference between comics and real life is that people age. Ian knows that it can be demanding to play a whole SOLO movie. So I do believe he made the right choice. well, why do they have to include the present (old) Magneto on the origins when they can just focus on Magneto's past and mastering his powers? I don't think Ian needs to be part of the film. Well its not like Magneto is drawn as a young man in his prime in comics.